A no-cook three ingredient sauce, now that’s my kind of cooking. And no worries about finding the Korean chili paste, I've see it everywhere these days. And you’ll want to use it for lots more after you experience it on this chicken. For the sauce, stir together a few tablespoons of the gochujang fermented chili paste with a quarter cup of orange juice and a splash of rice wine vinegar or mirin. You’re after a French dressing type consistency, so adjust the amount of chili paste and juice as needed. Over medium heat, toss a few handfuls of dry roasted peanuts in a dry pan until they start to brown. Immediately toss them together in a bowl with a tablespoon of toasted sesame oil and some chile powder until well coated, then set aside. 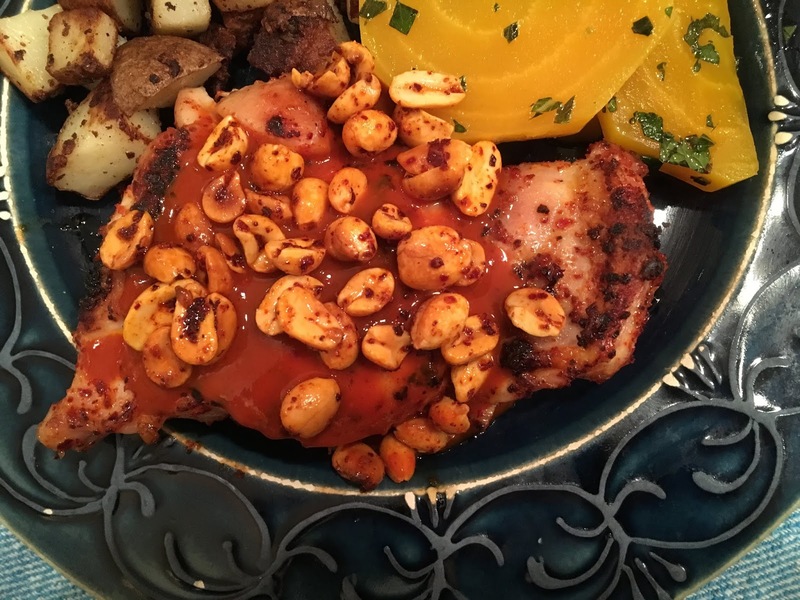 After broiling, barbequing, or pan frying your lightly salted chicken, toss in the sauce and serve with the peanuts on top.